Could Religion Be the Answer to Rescuing Indonesian Wildlife? ProFauna, which is engaged in the protection and conservation of animals and their habitat, seems to have made a breakthrough to overcome the hunting and trading of Indonesia’s protected wildlife using a religious approach. Concern has grown over the widespread illegal hunting and trading of protected wildlife in Indonesia over the last five years, which many blame on the public’s lack of education. In the hands of nature: Sumatran elephants are a highly sought after species in Indonesia. According to Islamic teachings, this large animal should not be used by humans. This includes circus elephants. Environmental activists in Indonesia have resorted to different strategies to remind the public of the importance of protecting and preserving the existence of all living beings on earth in order to create natural balance. Many have been busy organizing campaigns, road shows, while others have focused on fostering dialogue with stakeholders, providing education through school activities or using to stronger legal instruments to bring attention to these illegal activities. ProFauna Indonesia in Malang, East Java, has chosen to tap into people’s religious beliefs to raise people’s awareness of the importance of taking conservation seriously. The NGO, which is engaged in the protection and conservation of animals and their habitat, seems to have made a breakthrough to overcome the hunting and trading of Indonesia’s protected wildlife using a religious approach. It initiated a collaboration with 35 Islamic boarding schools in East Java, inviting their representatives to discuss and study how Islam cares for the existence of species of wildlife, particularly those under protection in the country. The two-day discussion and study held in mid-2010 resulted in a simple guidebook entitled Islam Peduli Terhadap Satwa (Islam Cares for Wildlife), containing Islam’s view on the well-being of animals. “All meeting participants agreed Islam is basically concerned with wildlife, and condemns cruelty toward or abuse of animals. Islam also promotes proper care for the preservation of animal species,” Rosek, the founder of ProFauna, told The Jakarta Post in Malang recently. The 60-page book, the first of its kind in Indonesia, gives a comprehensive overview on the rescue of protected wildlife in Indonesia from the perspective of Islam, touching upon the law concerning rare animal hunting, the use of animals for medicinal and nourishment purposes, the raising of animals and cattle, and the law dealing with animal treatment in circuses. As a country with the largest Muslim majority in the world, Indonesia holds a very important role in enhancing Muslims’ awareness of — and attention to — wildlife, especially given the nation’s great diversity of wildlife species. Based on estimates, Indonesia is home to 300,000 animal species or 17 percent of the world’s wildlife, although the country represents only 1.3 percent of the world’s land area. It is believed that once Indonesian Muslims become better acquainted with the need for protecting animals, wildlife as well as domestic species, many more species of animals will be preserved in the end. Many people still mistreat animals. A survey conducted by ProFauna Indonesia in 70 bird markets in 2009 discovered 183 protected species were still being traded illegally. Of the 70 bird markets or locations inspected in 58 cities, 14 traded parrots and cockatoos, 21 primates, 11 mammals and 13 raptors. Eleven markets sold protected species of songbirds. “We deal with this problem by taking a religious approach, especially Islam as the religion of the majority in Indonesia,” said the alumnus of the School of Biology, Brawijaya University, Malang. Meanwhile, the head of Al-Hikam Islamic boarding school, Malang, Mohammad Nafi’, pointed out that although the earth and its resources were meant for humans, Islam had also taught its followers to conserve nature. “Allah evidently forbids us from inflicting damage on the earth, which has a broad meaning because it involves nature and living organisms on its surface, including wildlife as part of nature,” added Mohammad Nafi’. According to Nafi’, many stories in the holy book Al Qur’an and Hadith (traditions and sayings of Prophet Mohammad) show that Islam teaches Muslims to love animals. The tale of a woman relieved of her sin for having given water to a thirsty dog is an example. “The stories of Solomon and Noah also further indicates that animals are not to be abused,” he noted. The copies of the guidebook will later be distributed to all boarding schools for free. Monkey protection: the orangutan is one of Indonesia’s protected animal species. Orangutan however are still sold illegally in m: Monkey protection: the orangutan is one of Indonesia’s protected animal species. 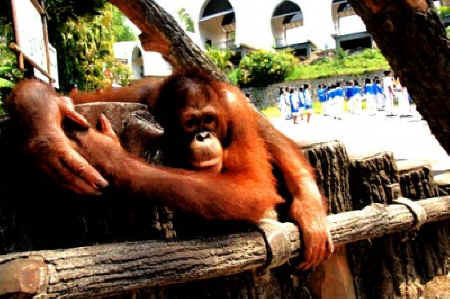 Orangutan however are still sold illegally in markets around the country. According to Purnawan Dwikora Negara, an environmental law lecturer at Malang’s Widya Gama University, taking a religious approach to raise awareness about the environment is indeed a necessary breakthrough. So far, channels such as religion, which do not involve litigation, have sometimes been able to address problems arising in society, including those pertaining to the environment. “On average, the rate of success using methods that avoid litigation can reach 60-70 percent,” Purnawan pointed out. 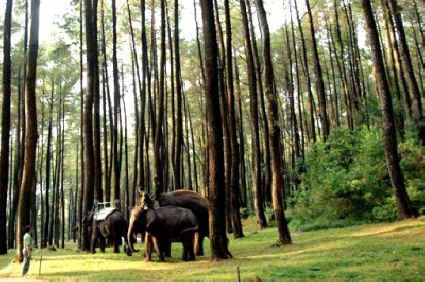 Even though laws have been passed, such as Law No.5/1990 on the conservation of biological resources and their ecosystem — which stipulates a five-year imprisonment and a Rp 100 million fine for the trading of protected wildlife — illegal transactions continue to take place openly in many places in Indonesia. Therefore, Purnawan sees what NGOs like ProFauna have done with boarding schools as a progressive approach. “It’s because religious communities have the highest level of obedience in Indonesian society. We leverage this,” said Purnawan. Besides, the Indonesian Environment Forum (Walhi) has taken the same progressive path campaigning for the environment with religious students.